The new central promenade through Peavey Park is taking shape! The second phase of construction at Peavey Park is proceeding smoothly. Now that demolition and heavy earthwork are complete, work on underground utilities and park paths is under way. 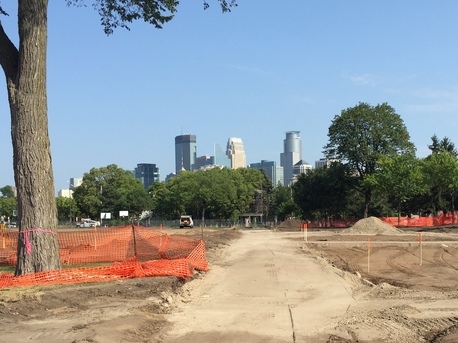 Currently, the work on this Minneapolis Park and Recreation Board (MPRB) project is on schedule to be complete in November, with the opening of the new athletic field and playground planned for spring, 2019. Thank you for your patience while we work to improve Minneapolis parks and recreation centers! Funding for this project includes a $1.1 million allocation from NPP20, a historic agreement between the Minneapolis Park and Recreation Board (MPRB) and the City of Minneapolis. NPP20 helps address racial and economic equity across 160 neighborhood parks and provides $11 million annually to maintain, repair and replace facilities.